Warm clothing for Antarctica or any cold conditions, these principles apply to anywhere when the temperature starts to drop and the wind to blow. The "layer method" of dressing is more effective than a single bulky garment. Several layers are built up, each of which has its own part to contribute, insulating air is trapped between as well as within layers, flexibility is maintained as conditions change. 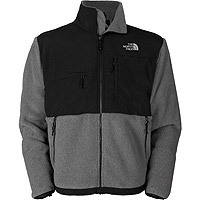 A close fitting layer that provides Insulation and wicks away perspiration from the skin to maintain comfort. The layer next to the skin, this should be soft, comfortable and able to wick away perspiration quickly so leaving you feeling dry in spite of your exertions in the cold. Damp clothing in the cold can reduce the insulation significantly, so it is important to get sweat away from your skin and away from your clothes - breathability is of the utmost importance. To function most efficiently the foundation layer should be close fitting to the body. For the coldest climates, long underwear is a must. Things have come on an awful long way since the string vest (invented for the British Graham Land Expedition to Antarctica in 1934-1937). Modern foundation layer garments are generally made of synthetic material. In some cases the material is even treated so that it prevents the build up of bacteria that live in sweaty clothes and make them smell, especially important if you don't have lots of changes of clothes or opportunity to wash them very often. If you're not going to an extreme climate but the extreme climate has temporarily come to where you live, a good thermal long underwear layer along with a hat, gloves, warm socks, thermal insoles and scarf or neck gaiter are the cheapest way of effectively dealing with the short-term conditions between transport and home, work-place or wherever you need to go. The gold standard of thermal underwear is merino wool, not a budget option but it really does deliver performance-wise. A soft and fine natural product, the wool of the merino sheep, very good at wicking sweat from the skin surface and naturally odor resistant. 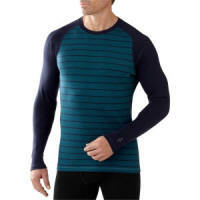 Insulated base layer tops - A versatile layer that can be your outer layer indoors and help keep you toasty outdoors. Insulated base layer bottoms- Long johns - To go under thick, warm pants and outer over-pants (waterproof for the summer months or when on the sea in boats). It's unlikely you'll need any long underwear for your legs in the Antarctic summer in coastal regions, unless you really do suffer from the cold. Mid Insulation Layer/s - A versatile layer that provides insulation with the ability to easily remove or put on the layer. Buttons, zips and the like allow for ventilation during exertion or the ability to quickly close everything up when the weather worsens. 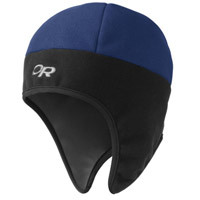 This is the most variable layer and can be added to as required depending on how cold the conditions are. 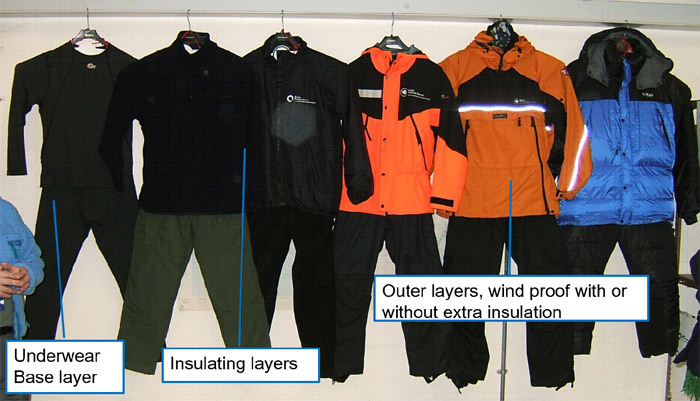 More than one lightweight layer of shirt/s, sweater or jacket allow for flexibility by adding or removing according to weather and activity and is warmer than one thick heavy layer for insulation too as extra air gets trapped between the layers as well as within them (though less convenient). Traditionally woolen sweaters and natural fiber pants were worn. These days, these may still be used or they may be supplemented or substituted by modern materials such as polypropylene fleece or lightweight down garments. This layer should provide insulation and also the passage and release of perspiration. Zips, collars, draw cords and the like allow for increased ventilation during exertion or for all openings to be pulled closed while at rest and/or in very cold conditions. Wool mix or synthetic shirt, woolen sweater, fleece or down sweater and /or jacket. Adjustability is important here, zips, buttons etc. At least one of these layers should be long at the back to avoid exposure of flesh during exertion. The insulating layer can be combined with the wind-proof or water-proof outer layer or could be separate. Don't be tempted to think that you will be able to get away with a fleece as your only outer layer however, despite the new coatings and finishes, they just aren't wind or water-proof enough on their own. You might prefer a lightweight down-filled parka, while these are extremely warm and can easily be thrown on over a t-shirt for immediate serious insulation, they can be inflexible in terms of layer dressing when walking ashore, light-weight ones are more versatile. 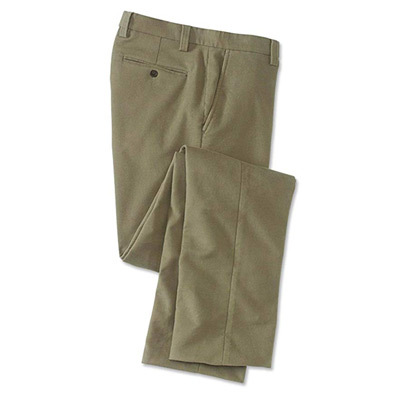 Thick warm pants of a natural material such as moleskin or heavyweight synthetic material such as polyester or nylon. Personally I have worn moleskin (a kind of cotton, named for its texture and not made from either the skin or kin of moles) pants in both polar regions and wouldn't consider wearing anything else, for warmth, comfort and practicality they have no rival. Pants should not be tight fitting, so ditch the skinny fits until it warms up again. Wind chill - the commonest reason that I see people being cold in cold conditions is that they don't take enough consideration of the effects of the wind. Ensuring that the outer layer is made of properly windproof material rather than something that invites the wind in for a good blow around can make all the difference and can reduce the amount of clothing that you need overall. At warmer temperatures, the wind makes little difference. As the temperature falls the wind begins to have a disproportionate effect. The table shows the effect that the wind speed has on apparent temperature, the numbers in the blue section are the equivalent reduction in temperature at that point. The colder it gets, the greater the cooling effect of the wind, even if it's no stronger. With a wind speed of 10mph at +30F, the wind effect is to cool by another 9 degrees to +21, by the time it's -20F, the same wind has a 21 degree effect to -41. The Outer or Shell Layer - This layer provides direct weather protection, it must be windproof and may be waterproof depending on the temperature it will used at. Sometimes literally a "shell" or with additional insulation built in. Outer / shell layer, this needs to be windproof and may be waterproof. It could be simply a "shell" i.e. no additional insulation or it may have insulation built in. Jackets should always have hoods. The outer layer is particularly important and should have features such as draw-cords and fastening cuffs to prevent warm air being lost to the outside and to prevent snow finding its way into nooks and crannies (snow in the cranny is most uncomfortable). Waterproof is not necessary for very cold weather as no rain falls, though if you intend to spend any time in boats waterproof is vital as you don't want to get ashore after bouncing over an excitable sea to find you are wet and cold for the rest of the day. 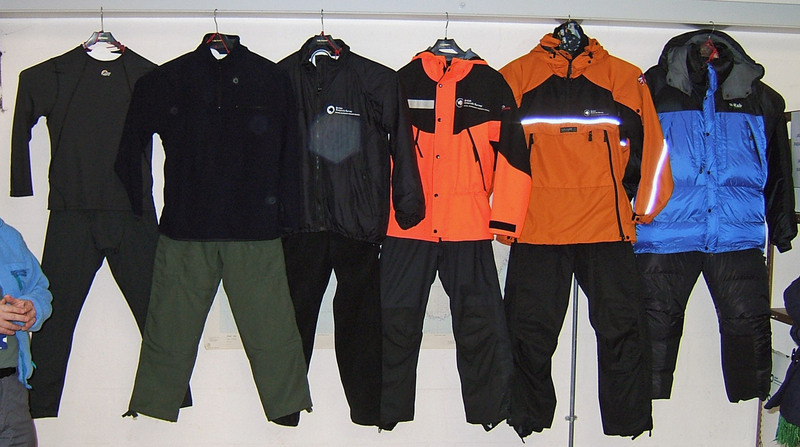 Fully waterproof garments are not as able to transmit perspiration as readily as garments that are not fully waterproof and tend not to be as soft and flexible at low temperatures, choose according to your intended use. Insulating materials for this outer layer where they are used can be synthetic or the traditional and arguably still the most effective - natural down. 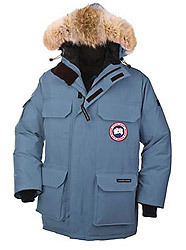 Polar parka, with down or synthetic insulation, down is lighter and warmer, synthetic is still effective when wet. 3-in-1 Jackets, a windproof and often waterproof outer shell with a separate insulating inner jacket, worn separately or together for two layers in one. Waterproof rain pants for riding in the zodiac and staying dry during landings, light-weight ones are fine and will be easier to pack away into your backpack. Large zips down each leg make it much easier to get them on and off. Military extreme cold weather clothing, military style or surplus clothing, effective and affordable if not pretty. Head, hands, fingers, feet and toes, not forgetting ankles, wrists and neck. The extremities can get very cold very quickly. Fingers and toes have a high surface area compared to their volume - this means they lose heat easily and generate and retain heat poorly. Particular attention should be paid to keeping them warm. The head can lose up to 20% of the body's heat, in cold weather, the quickest and simplest thing that can be done to warm up is to put on a hat, particularly convenient and useful when taking a rest break after some exertion. In extremis for the sake of survival, if the body is losing so much heat that it may be in danger, blood flow to those parts losing the most heat and that are "expendable" may be shut down to a trickle. Needless to say, this will not happen to your whole head, but may affect ears, nose or cheeks. This could result in frostnip, frostbite and ultimately the loss of that body part, fingers and toes are in the most danger. 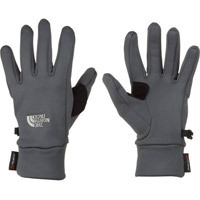 In very cold conditions 2 (or even 3) pairs of gloves or mittens according to the conditions and activity. The layer principle can also apply to the hands. 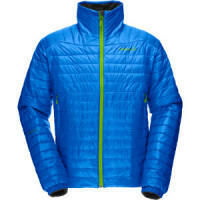 A light first layer, then an insulating layer and/or a weatherproof outer layer depending on use. Usually starting with lightweight gloves in case you have to do something fiddly, thin gloves are easier than mittens and infinitely preferable to bare fingers and then one or two pairs of mittens (two if the outer pair is usually just a "shell" layer). The outer pair should be wind proof while water-resistance is always very useful when in and around small boats. Ski-type gloves are good as they are warm and water resistant with it, they are usually adequate for polar coastal regions in the summer. A thin pair of glove liners as well as a warmer pair means that you'll be able to take photographs without taking them off. Fingerless gloves or ones with a flap so that you can push fingers through without taking them off are hopeless in my experience, don't bother unless you've used them before and know that you like them. In extreme cold weather mittens are much warmer than gloves, though by the time you have a couple of bulky pairs on to make your fingers lovely and toasty, your dexterity falls dramatically, so it depends on what you're doing. Skiing or skidooing for instance and mittens will be fine, if you are taking photographs you'll find things more difficult. Sensor gloves: Gloves that allow you to use touch screen devices without needing to take the glove off. You can lose about 20% of your body heat through your head, the quickest way of warming up your whole body is to put on a hat. Having an extra hat in your pocket is always a good idea in cold conditions so that you can put it on when you stop walking/climbing/skiing to maintain your temperature when your exertions have reduced. In cold conditions you will have an outer shell layer that has a hood, whether it is insulated or not, your hat/s add flexibility so you have a variety of insulation levels according to your activity level, the temperature and wind chill. Your hat should cover your ears which can very quickly become painfully cold in Antarctica's biting wind. This can be a beanie type hat that you can pull down, or it can be one with ear-flaps that can be pulled or rolled down when needed. My preference is for a fleece hat in wind-stopper fabric with fold down ear-flaps like the one to the right, small enough to easily slip into a pocket with a warmth far better than you'd expect for the size. Balaclavas are good too, they roll up to look like a normal hat, but can be rolled down with your hood pulled over them when it gets colder. While your hood will be wind-proof, you don't necessarily want to have it up all the time, a wind-proof hat can be far more convenient and give better visibility and freedom of movement, saving your hood until it is really necessary. Hats are probably the most personalized piece of cold weather kit you can get with lots of fancy colors and designs, be careful not to get carried away by form over function, those cute dangly pom-poms can get mighty irritating when the wind starts whipping them against your face. While on the subject of pom-poms, the ones on top of the hat can make it impossible for your hood to fit snugly which means there's a large air gap resulting in reduced insulation. One or two pairs of thick warm socks, wool is the material to go for here, a small amount of a synthetic material such as nylon aids durability and some stretchy material such as elastane gives a snug fit and stops them falling down. There are lots of thick acrylic socks out there which while cheaper just aren't as good as wool in cold conditions. The layering principle also applies here with more than one pair of thin socks being warmer than a single thick pair. Don't be tempted to cram too many socks on so that your boots are tight. Air is the insulator and squashing it all out means you won't be as warm. A bit of trial and error to see what works for you and your preferred cold weather footwear, start with a thin pair of everyday socks as undersocks and then a thick pair on top and see how it goes. Ordinary plastic or leather hiking boots cannot be worn when it is very cold and boots called Bunny Boots, or Mukluks are worn. 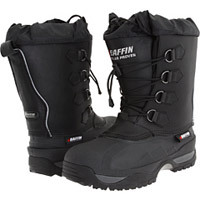 These have soft insulated uppers, thick plastic soles and thick insoles to prevent heat loss to the snow and ice for really cold conditions. 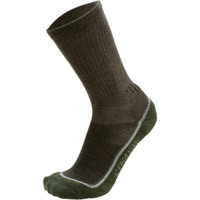 They are great at keeping you warm, but not so great for walking over very rugged terrain or climbing. For use in and around boats in the Antarctic summer, the modern take on rubber wellington style boots are ideal with a close fitting and insulated neoprene upper. They are much better for walking in than traditional wellies as they fit more closely to the lower leg and are increasingly used by tourists and guides. They are waterproof up to the top so you don't have to worry when getting in or out of the zodiac, you can be comfortable in them all day. When the body is insulated including the extremities, the next most vulnerable regions become those that don't normally lose heat relative to the rest of the body and so are usually neglected. Wrists, ankles and the neck region can soon become very cold and uncomfortable. They can lose a lot of heat if not wrapped up as they pass warm blood between other well insulated areas. 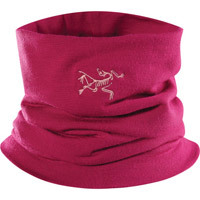 A scarf or insulated "neck gaiter" of some kind to insulate the neck, also to keep warm air from "pumping" out of the body region, and stop wind-driven snow from getting into the clothing where it could melt and become very uncomfortable. Boots that cover the ankles to provide warmth and support too. 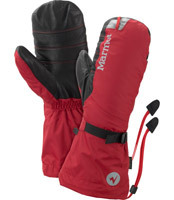 Mittens and gloves with long wrist cuffs, these can reach about half way up the forearm for conditions of extreme cold. Sunglasses are a must to prevent glare from the snow and ice and stop you from developing snow blindness, the highest UV rating is a must. Goggles in colder weather or in conditions of blowing snow to prevent snow from getting in the eyes and to cover the top part of the face. and then alternative shells to go over these depending on conditions and activity levels to the right. so limiting what can be achieved. When fully dressed for extreme cold, there should be no cold-spots, there should be no way you can move around (normally) and expose flesh or just a single layer at the wrists, neck or midriff. The outer layer should be just that, the outer layer at ALL times, don't try to use an inner jacket/layer as the outside one, you'll be far too cold by the time you realise it's not working very well. With goggles on and a good hood drawn about the face and a balaclava, it is possible to have no exposed flesh at all. 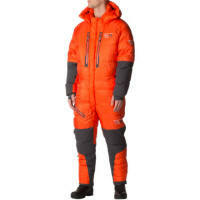 Also important is to be able to vary the clothing easily, draw-cords and "pit-zips" (zips in the armpit of the shell layer) allow for ventilation when loosened / opened or insulation when pulled close, hoods, balaclavas and hats can be added or removed according to changing weather and activity. Generally Antarctic gear appears rather too big when seen in isolation. Shirt / jacket / sweater "tails" are long, boots are chunky, mittens are long and hoods are large. 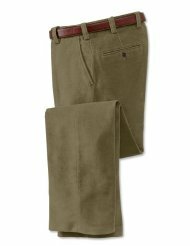 Over pants in particular may seem large as they are designed to be put on when outdoors if the weather gets particularly bad. In such conditions, you can't sit down and calmly take your boots off first. The outer layers quickly go over everything underneath and then zip / draw / tie, closer to the body to keep the heat in. I found this site by googling "extreme cold weather clothing" because I am sick of being stuck in the house for three months every year when the temp drops too low for me here. I live in Ohio and it drops to twenties and below and often with winds and I get chilled to the bone when I try to wait on public bussing even just for ten minutes. I bought and wear expedition weight thermal long johns top and bottoms, jeans, wool socks over polyester socks, cotton polyester shirt, two fleece sweaters, a 550 fill down classic Alaskan parka with a fleece gator and thick gloves......AND I'M STILL COLD!!!!! My arms are the coldest followed by my torso and then my legs. I can't even stand being outside for ten minutes. After ten minutes I am chilled to the bone and start to ache....after twenty to thirty I start to shiver. wicking sweat away?? WHAT sweat??! How do I wick away the icicles???? Any suggestions would be deeply appreciated. Yes, I wear the tunnel hood secured over the high neck of the parka covering my face from the eyes down and also atop of the gator. You have my sympathies, some people are just more prone to the cold than others. 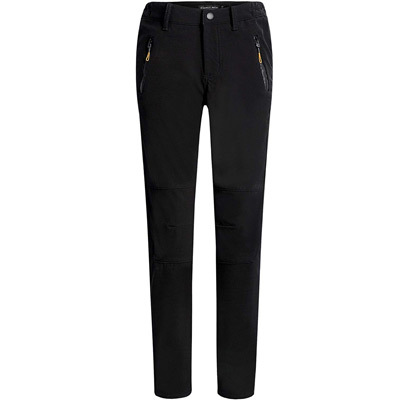 1 - Jeans, dreadful in the cold, in Antarctica we used moleskin trousers, you could get lined trousers or almost anything else, jeans are not good in the cold, a looser fit is better too, tight fitting loses heat more quickly for an outer layer. 2 - Neck (ok sorted), wrists and ankles - are they all insulated? Make sure clothes overlap and are insulated here. 3 - Shoes / boots - are the soles thick and insulated? An extra insole may help if they aren't, you can lose a lot of heat this way. 4 - Headwear - you don't mention anything and vitally important, you can lose an awful lot of heat through your head, an old saying - "If your feet are cold wear a hat". 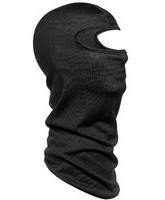 Hoods alone can be a bit loose, a beanie or balaclava under it can make a big difference. 5 - Wind proofs? Is the outer layer windproof? If the wind can get through and take heat away (like with jeans) the effect can be significant. 6 - Heat from the inside, are you properly fed? Your metabolism will adjust to cold temperatures after a while and burn fuel to warm you up - as long as it has enough fuel, it's not a coincidence that we generally hanker after stews and soups and hearty food in cold weather rather than summer salads. 7 - Health issues. There are a number of medical conditions that can result in feeling cold all the time, in particular anemia - a lack of iron in the body and/or inability to make enough red blood cells, hypothyroidism - from the inactivity of the thyroid gland, blood vessel issues - resulting in a lack of blood flow to the extremities in particular, diabetes - can lead to kidney damage, a symptom of which is feeling cold all the time, anorexia - from the lack of body insulation and food to burn to produce heat from within.